Headlines about teacher and teacher union concerns over efforts to link teacher performance evaluations to student achievement scores leave one with the impression that teachers are either unwilling to be accountable for student achievement or that they are just resistant to changing their ways. Yet, those of us working in schools and districts know that most teachers feel the weight of student achievement on a daily basis and that change and improvement are constants of the profession—from implementing new state and district programs to seeking new and better approaches for reaching students. So if teachers are not resisting accountability or change and do want to improve student learning, why are they often circumspect about education reforms? Teacher wariness frequently speaks to issues of trust in educational organizations. Where trust is absent or compromised, there will be cautious teachers. Though it is frequently spoken of as a feeling or intuition about a person or situation, trust is actually engendered through a rational weighing of experience and evidence. Psychologists maintain that trust represents a willingness to be vulnerable to others, confirming that there is judgment involved in trust and giving credence to the notion of “earning” trust. The competence and good intentions of others in the educational organization, not just so they can do their work but so they can do it well. While teachers are busy working with a classroom of students, they must trust that parents, principals, support staff, and district leaders are treating their own responsibilities to students with the same level of priority. For example, a teacher must trust the instructional competence of the principal who is providing feedback on her performance or the good intentions of the superintendent who is advocating a new policy or program. A strong formal communication system—open and interactive—within the school and district organization because they are within the walls of a classroom for almost all of their working hours. There are no breaks at the water cooler to catch up on or speculate about the meaning of the latest district news. Consider, for instance, the dilemma of the teacher who finds out belatedly that the assessment calendar has been modified and testing days are a week earlier. For teachers, being left out of the information loop or coping with messages that are impartial, inaccurate, unclear, or ambiguous is disempowering, erodes trust, and may have deleterious effects on student outcomes. The integrity of the leadership of the school and district organization because the power structure of school districts is skewed away from classroom teachers. Though unions provide collective teacher voice, on a day-to-day basis, teachers must trust that school and district leaders will make decisions with students’ best interests in mind; that they will ask for, listen to, and include teacher perspectives on improving teaching and learning; and that they will follow through with their commitments. The teacher culture is rife with anecdotes that contrast what was promised in a program change with what actually happened. For teachers to believe that a new program or policy is a good one means that they trust in the educational competence and motives of those proposing and implementing the change; that they trust they are in possession of the facts and will continue to receive the latest and best information; and that they trust that they and their students are important to those making the decisions. Secondly, consider that “trust” is, according to leadership guru Warren Bennis, the lubricant that makes organizations run. When trusting relationships exist in schools and districts, authentic conversations among teachers and between teachers and principals are more prevalent. Where there is trust, risks associated with implementing new programs and policies are more readily assumed by everyone. It is at the school and classroom level that change in education must take hold and, not surprisingly, studies show links between the level of trust in a school culture and the level of student achievement. 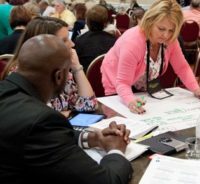 Finally, consider that whether a policy or program initiative originates at the federal, state, district, or school level, teachers and principals are the primary implementers. Thus, it is the character of their working relationships that leads to quality outcomes. Trusting relationships are not merely a “feel good” exercise. They are basic to effective school and district leadership. But in times of change, the quality of teacher trust and the character of the teacher-educational leader relationship are even more critical, which means not leaving them to chance. If we want teacher performance evaluations to contain a student achievement component, we should first ascertain that we all know what policies and practices will make it top-notch and thoroughly reliable. Next, we should verify that everyone has the same access to information and to opportunities to provide and receive feedback; and lastly, that school and district leaders are open, transparent, and honest in their decision-making and their commitments to teachers and students.